Aragosta is situated in the Fairmont hotel at Battery Wharf. Sadly, it was a rainy Sunday when Leslie and I went for brunch, so we could not enjoy the outdoor patio with a lovely view of the Boston harbor. We had a Gilt City voucher ($40 for brunch for 2) and had our choice was of any brunch cocktail, juice or coffee and an entrée. We ordered the Maine lobster roll ($22) and a mushroom, goat cheese and truffle omelette ($22) to share. The lobster roll came on buttered brioche roll. I thought it was fine; Leslie did not like the filling. We both enjoyed the duckfat fries. 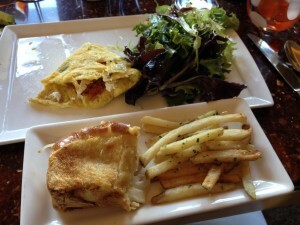 The omelette was fluffy and tender; I was underwhelmed by the truffle, but Leslie enjoyed it. The salad was a nice accompaniment. The service was attentive and my peach bellini was delightfully effervescent. The voucher was a good deal; I think the normal prices are steep.